Why do my custom datetime strings STILL depend on client locale? Not only is the order different, but we’ve got slashes, dashes and periods. Fortunately it’s all taken care of for us! But while that’s great for the front-end, having the back-end pass around these localized date strings is just asking for trouble. Of course, the Right Way™ to format DateTime strings for back-end use is with the Round-trip format specifier (“O”), which creates an unambiguous, Culture-invariant, timezone aware and ISO 8601-complaint string representation (which looks something like 2014-12-15T22:48:51.0000000-05:00). Not too bad really, there might be some issues if the app happens to run in a different timezone than the web service, but at least that custom format string will make sure those timestamps are always in the same format. Except it doesn’t. Soon we start finding entries like this 12-15-2014 22:48:51. Dashes?!! WTF, we clearly specified *slashes*! Turns out the “/” character in a DateTime format string is actually just a placeholder for the localized date separator. It will be replaced by whatever the client set it to. Keep in mind that users are not locked into the regional defaults and are free to customize their own date/time settings. Don’t assume that your English-speaking users won’t go and change the time format to something unexpected. Seriously though, just use “O” if at all possible. It’s quick, easy and solves this problem and many others. Today I discovered that PostgreSQL supports partial indexes and I’ll share my scenario for when a partial index has a number of space/speed advantages over a traditional index. My application consists of many grid-like maps onto which users can place objects. Some objects don’t have to be placed right away; these appear in a staging area, which will become important later. The map creation process is collaborative and one user might make a change, save it and hand it off to another user to complete. Eventually when all the changes have been made, we attempt to finalize the modifications. Part of this process is to ensure that there are no objects left in the staging areas. But since we only care about one specific lookup (-1, -1), nearly all of the index entries would be completely useless. Preliminary tests showed that it would result in several GBs of unnecessary index records and might slow down inserts/updates too. Only entries that satisfy the conditional will appear in the resulting index. I still get the same blazing fast lookups, but now my index will be a tiny fraction of the size and won’t need to be updated for the vast majority of insert or update operations on the table. It seems the hardest part of writing good unit tests is trying to mock out third-party dependencies. A surprising number of the core Microsoft libraries like System.IO simply aren’t unit testable, so I was almost unreasonably happy when I stumbled upon System.IO.Abstractions, which describes itself as “Just like System.Web.Abstractions, but for System.IO. Yay for testable IO access!”. At the core of the library is IFileSystem and FileSystem. Instead of calling methods like File.ReadAllText directly, use IFileSystem.File.ReadAllText. 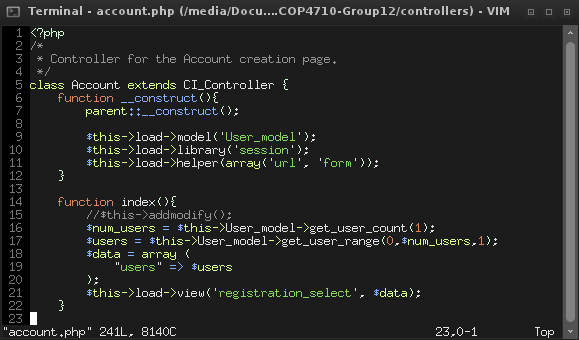 We have exactly the same API, except that ours is injectable and testable. Instead of http://sub.ninjanichols.com:8080/, I get http://sub./. What’s going on? Turns out the colon has a special meaning in PowerShell, it’s used both to specify items on a PSDrive, $Env:Foo, or to associate a variable with a scope or namespace, $global:var. So when PowerShell tries to interpret $domain:8080 it sees one variable, instead of a variable + a string. Recently I submitted a paper to an ACM Conference. When I was reviewing the final draft I noticed that the fee value in the copyright block was incorrect. For example, in the block below the fee is automatically set to $5.00 but the Conference I’m submitting to has a fee of $10.00. Copyright 2011 ACM 978-1-4503-0918-9/11/08 ...$5.00. I recently began using OpenBox as my window manager in Linux. One issue I ran into was that my media players were unable to automatically bind to the global media hotkeys. My solution was to write a little bash script to control the media players using DBus. Right now I have support for Banshee and RadioTray. VLC support should be fairly easy to add, but I haven’t had the motivation to search for documentation on their DBus interface. # Controls playback on any running media players. 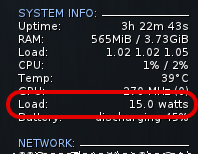 ech o "usage: media-controller <command>"
ech o "Command not supported for this player"
How much power is your laptop using? Products like Kill-A-Watt show how much power appliances are using. It’s good way to measure your computer’s power consumption — when it’s plugged in. But what if I want to know how much power my laptop is using when I’m not plugged in? Turns out it’s fairly easy to get battery info. Running cat /proc/acpi/battery/BAT0/state should return the current discharge rate and total battery capacity. The trouble is that the “current rate” field sometimes switches between mW and mA. I have no idea why this is the case. Oh well, we can easily convert mA to mW with the formula: $latex watts = amps times volts $. # Print the current power consumption in watts.